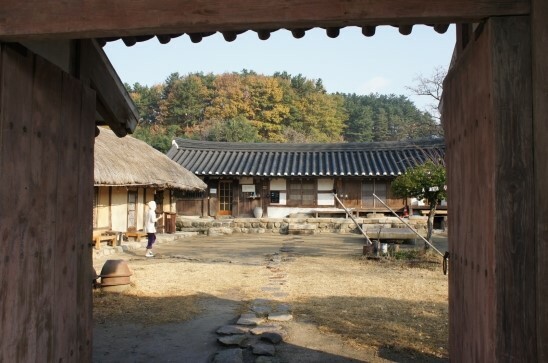 I have stayed a special night at a quiet and peaceful old house, general Kim Ho’s old house, which is located beside Oreung (the five royal tombs) in Tap-dong, Gyeongju. General Kim Howas a military officer performing meritorious deed in Nogok, Gyeongju, during the Japanese Invasion of Korea in 1592. 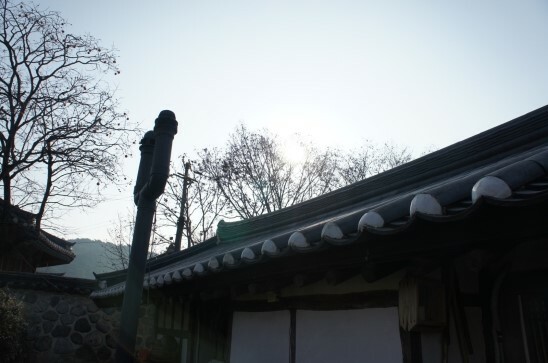 This house has been managed by descendants of Kim Ho for over 400 years, and the shiny appearance of this house that has not been overshadowed by the long years still has remained intact. Let me tell you about one night spent in the opposite room that is brimming over with warmth by making a fire in the fireplace. I met people to stay with and had a dinner with them at Ssambab-jib, A Korean restaurant that serves rice wrapped in greens, on Daereungwon Street. The sun had already disappeared. Feeling something lacking in so little daylight, we took a taxi heading towards general Kim Ho’s old house. I thought this place was outside the perimeter of the downtown but, it was only a ten-minute taxi ride away. We were the only guests because it was a weekday, so the landlady illuminated the lights in the yard for us. There was the main building with tiled roofs and the wing of the main building which was thatch-roofed. The harmony between the main building and the wing was interesting. 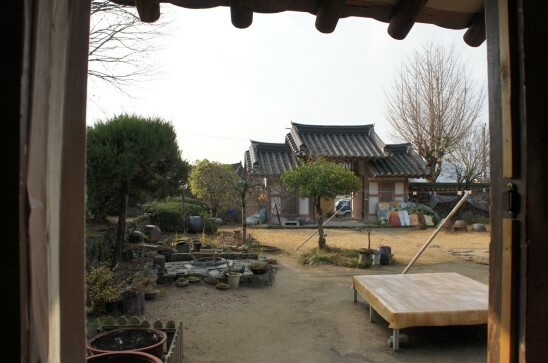 Stepping into the yard through the front gate, you may come to view the main building of the house, the wing, and the beautiful gazebo located in a low hill on the right side of the yard. The quiet and peaceful feeling envelopes one and remains intact. The room where we would stay is the opposite room located on the right side of the main building. The landlady who has been obedient to her husband, the 14th descendant of Kim Ho, said that she started her newlywed life in this room. Upon opening the door of the room with this story, I could see a sparsely furnished room with an old stationery chest and bedding. Staying in simple room for a day makes me feel refreshed in heart and mind. 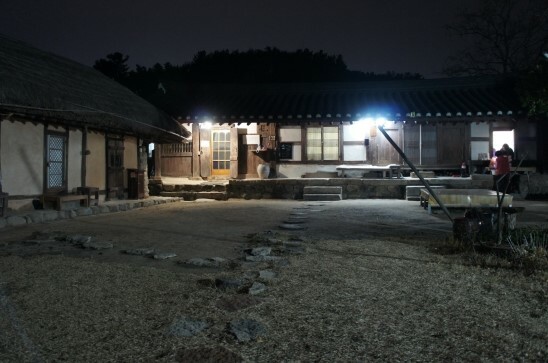 General Kim Ho’s old house has four rooms to accommodate guests, but the opposite room is the only Ondolbang (a floor-heated room) heated by making a fire in the fireplace. Due to poor fireplace performance, electric boilers have been installed in the other rooms. I’ll take a chance and explore the old house properly. Before I came here, I prepared some sweet potatoes to roast in the fireplace. I’m always well prepared for this kind of situation; indeed, I had packed plenty of medium sized sweet potatoes. The landlady said that she had made a fire in the fireplace to warm the opposite room up in the morning. 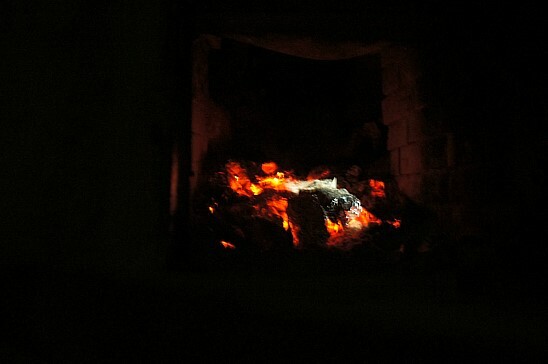 Charcoalsuitable for roasting sweet potatoes was burning when I opened the fireplace. I put the sweet potatoes wrapped in aluminum foil in the fireplace. The skilled landlady roasted them for us. 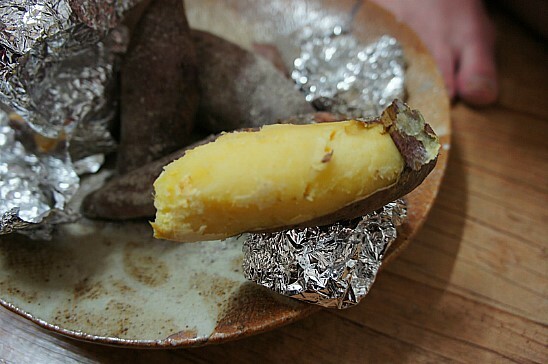 Yellow sweet potato is irresistible. The hint of the smell of burning enhanced the taste. I ate it with coffee and tea brought from old house kitchen. Water purifier, tea and coffee are always ready in the kitchen. You can have hot drinks whenever you want. I had lost track of the time eating sweet potatoes, but find its only 09:30 p.m. Around this time of the night, it’s still early evening in the city but, it seems to be past midnight in the old house. The night is very calm. The only light illuminating the old house is ours. When stepping into the yard, I couldn’t distinguish the things in front of me because the darkness deepened. It's too bad that the sky is overcast. If l lie down on a low wooden bench in the yard and look up at the sky on a clear day, I can watch stars that seem to be raining. Next time, I would like to stay at the old house on a clear day. The flame of firewood that had been blazing in the fireplace seemed to have diminished, and no smoke was rising from the chimney but the room was still boiling hot nevertheless. Last night, the portion of the floor closest to the floor heater (lower side of the Ondol) was hot while the portion away from it (upper side Ondol) was cold, so I put three pieces of firewood into the fireplace. The person who lay down near the floor heater couldn’t sleep well because the floor was too hot. Three modern-minded women lacking in an easy and composed attitude took a lesson from the flat stone used for the Korean floor heating system. By morning light, however, the old house was wet with morning dew, and the sound of birds singing was brimming over. If you register for breakfast from 08:30 a.m. to 09:30 a.m., you can eat the breakfast provided. In an instant, we devoured a fat and moist grilled mackerel, a rich/homemade soybean-paste stew (doenjang jjigae), and green tea leaf jangajji (vegetables pickled in soy sauce). The green tea leaves are handpicked in a green tea field in the backyard. Lastly, we drank a bowl of delicious scorched-rice water (sungnyung). We can enjoy all of this food for only 70,000 won. In the kitchen, the landlady brewed luffa tea that was made from luffa, some medicinal herbs and grain syrup. We drank this tea after breakfast and we began to explore the rest of old house. The front yard of the old house is so beautiful that I’d like to put a picture of the front yard in a frame and keep it. In the picture, the front gate is right in front of us. There are two rooms immediately to each side of the front gate. Each room is of a compact size suitable for two persons. 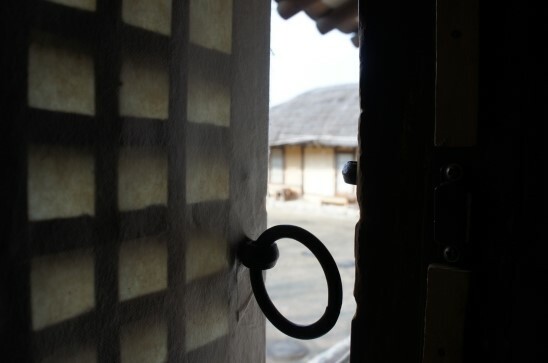 The main floor room (Taechong) of general Kim Ho’s old house has a sliding door that does not open to the view. This unusual style is interesting. 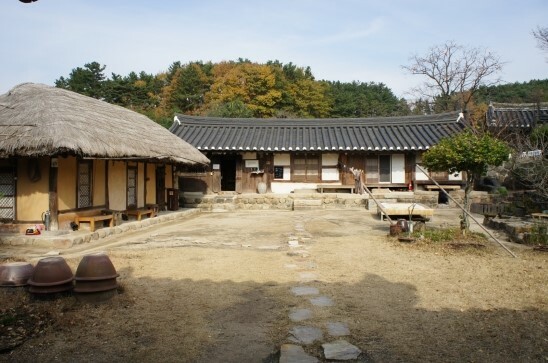 The well located in the front yard has existed since the Silla Dynasty and has not yet run dry. Now, it’s time to go. I have a heavy heart, standing with the doorknob in my hand. I wish I could stay a few days longer. By sitting in the main floor room and looking at the calm front yard, complex ideas faded away and that had made me feel refreshed. Slight discomfort makes you diligent. 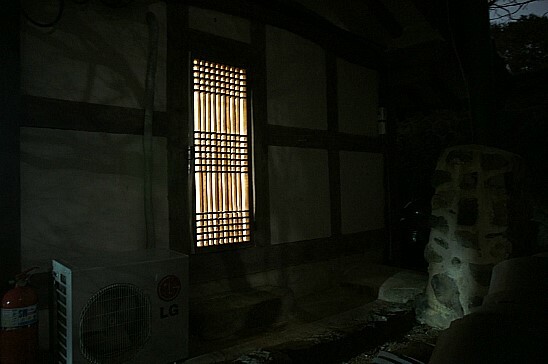 If you are planning a night at Gyeongju, how about staying the night at a quiet and peaceful old house? Get on the bus No.500, 505, 506, or 507 heading toward Nanam and get off at Ohreung intersection bus stop. Cross a road and take a 10 minutes’ walk along the alley beside the Ohreung Chalborippang store (barley bread) until you can find a sign post of general Kim Ho’s old house. It cost 4,300 won when I took a taxi at the rear gate of Daereungwon. An extra charge of around 2,000 won would be added when departing from bus terminal. If you are coming from Shingyeongju Station, I would like to recommend you to take a bus to downtown and then transfer to another bus or take a taxi from there. There are two rooms in the gate section on each side of the front gate. Each room is available for two persons. The opposite room where I stayed is an Ondolbang (a floor-heated room) heated by making a fire in the fireplace. This place accommodates from two to four persons. In the outer-wing building, the two rooms are connected. This place is recommended for guests of the family unit. This place accommodates from two to four persons. Showers & toilets are located next to the building’s outer wing. Both showers & toilets have been remodeled in a modern style, so that they are easy to use.